NFL 2010..One Roller Coaster of a Season! 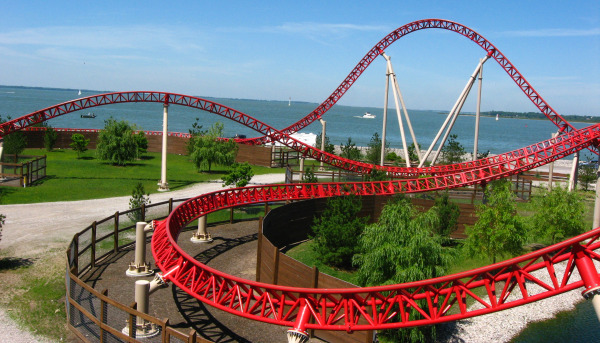 The 2010 NFL Season had more ups and downs than all the roller coasters in Cedar Point combined! 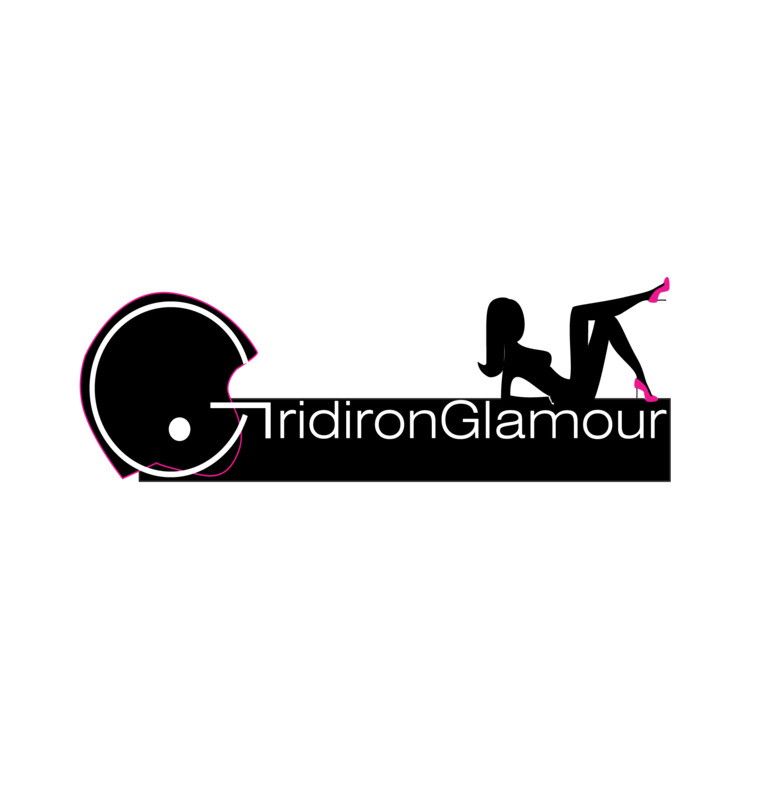 We love roller coasters and since the NFL season had just as many thrills and chills, we thoroughly enjoyed these past months on the gridiron. Here are just a few of our favorite highs and lows…. This is no doubt the “feel good” story of the year. Vick’s phenomenal performance after being incarcerated on dog fighting charges and being relegated to back up behind both Donovan McNabb and Kevin Kolb could truly be a movie script. The perfect ending may have to wait, though. Only a Super Bowl Championship seems like the larger than life finale fitting Vick, Andy Reid and the Eagles. In early November in a game vs. the NY Jets, 307 pound Ndamukong Suh, a rookie tackle for the Detroit Lions, lined up for the extra point attempt after the starting kicker got injured. While he missed the extra point, the sight of Suh making the attempt was definitely a highlight of the 2010 season! In the NFC title game vs. the Bears, Packers defensive tackle B.J. Raji intercepted a Bears pass and “ran” 18 yards for a TD. His hula hoop-like dance was one of the most amusing, fun moments of the playoffs! Click below to see Raji in motion. The Bears made it to the NFC title game, despite the preseason prediction by most pundits who beleived they were a below average team with little hope. In 2009, they went 7-9 and had failed to make the playoffs for the third consecutive year. The Bears ended the 2010 season at 11-5. Some people believe that luck was a big factor in their winning season, as they faced a number of back up QBs and a 7-9 Seattle Seahawks team in the playoffs. In Week 1 against the Lions, a Detroit TD was overturned by a little known, controversial call with just a minute to play, giving the Bears the win. Lucky or not, it was good to see the Bears return to the playoffs once again! The Packers’ QB finally emerged from Brett Favre’s shadow. His stellar play this season earned the Packers a Super Bowl Championship, but nearly as important, gave Rodgers the recognition he deserved. During the regular season, he earned a passer rating of 101.2 – the third best in the NFL. He also ranked third in rushing yards by a QB. In the post season, Rodgers had a passer rating of 109.8 and showed his composure and exceptional ability to read defenses. What we love most about the Aaron Rodgers 2010 story is that in addition to being a great QB, he seems to be a genuinely good guy as well! Washington Redskins coach Mike Shanahan started a streak of behavior in October that slowly spiraled into a complete lack of respect for veteran QB Donovan McNabb by the end of the season. Trailing by 6 and with less than 2 minutes left in a game against Detroit, Shanahan benched McNabb and put in back up Rex Grossman. On the next play, Grossman fumbled the ball, Detroit returned it for a TD. After that fiasco, most coaches would have tried to apologize for their poor decision. But Shanahan went in front of the media and awkwardly tried to explain his decision by first claiming he benched McNabb because he didn’t feel he could run the 2 minute offense. His statement was perceived as a criticism of McNabb’s intellectual ability by many in the public, so Shanahan changed his reason, stating that he actually thought McNabb didn’t have the physical endurance to effectively run the two minute offense. Later, he modified his statement once again and claimed McNabb was suffering from sore hamstrings. The tension between Shanahan and McNabb was quite evident. Later, with only 3 games left in the regular season, Shanahan benched McNabb in favor of Rexman and actually publicly demoted him to 3rd string. The Redskins had a myriad of problems this season. But it appears that Shanahan chose to focus on McNabb rather than recognize other issues hurting the team, including the coaching staff and their poor decision making over the course of the season. 11 INTs over a three game span brought forth criticism about Super Bowl MVP Peyton Manning. Some questioned his age, while others questioned his ability. Manning had to deal with a porous offensive line, a slew of injuries to his receiving corps and no running game all season. Despite his 4700 yards of passing this year, Peyton could not carry the team alone. But to question Manning’s ability is absurd and short sighted. It was one of the low points in the season for us, but Manning himself seemed unscathed by his critics. That focus and drive makes him one of the game’s all time greatest QBs! In a game vs. the Redskins, Young injured his hand. When Titans coach Jeff Fisher put back up Kerry Collins in, Young became agitated and a childish tantrum ensued. He paced the sidelines, swearing and mumbling to himself, and then tossed his shoulder pads and jersey into the stands as he stormed into the locker room at the end of the game. That day was his last as the Titans’ starting QB. Owner Bud Adams recently announced that Young will not be on the roster next season. He will either be traded or released. The NFL established a reactionary, subjective policy early in the season in response to a number of head injuries. While we applaud their efforts to protect players, this policy fell short and needs to be revamped before next season. In the most technologically advanced and extravagant stadium in the history of football, Jerry Jones’ Cowboys Stadium came up short on the most important day for the NFL. 400 fans attending the Super Bowl were unable to be seated because their seating area was not completed in time. The seats were valued at $800 and the NFL issued a refund of $2400 to each of those affected. Fans had the option to watch the game in the $350 “Standing Room Only” section or on monitors in the North Field Club. Despite these allowances by the NFL, fans were understandably upset. There is no excuse for incomplete seating areas in a venue like the Super Bowl! The Jets Strength and Conditioning coach, Sal Alosi, admitted he intentionally tripped Miami’s Nolan Carroll as he raced down the sideline on punt coverage. Alosi’s role in the NFL was to help players become physically stronger and healthier, yet he showed a complete lack of judgment when he tried to trip an opponent running at full speed. Alosi was subsequently fined and suspended by the Jets. Later, the NFL levied a $100,000 fine against the Jets. Alosi announced his resignation from the team January 31st. In late December, the NFL postponed the Eagles/Vikings game because of a predicted winter storm expected to dump 18 inches of snow on the city. Since when does FOOTBALL get postponed due to weather? This isn’t soccer and the NFL set a bad precedent by postponing the game when both teams were in the city and capable of playing. Vince Lombardi must have turned over in his grave! We hope you have enjoyed our review of our favorite ups and downs of this past season. It truly was an exhilarating ride, but like any good roller coaster, seemed much too short! Risk Taker or Play Maker? Which Jay Cutler Will Show Up? As the Chicago Bears head into Sunday’s NFC Conference Championship game against the Green Bay Packers, the question on many fan’s minds is which Jay Cutler will show up. Cutler is a complex character both on and off the field. On the field, he has moments of sheer genius, coupled with moments of utter idiocy. Off the field, he is seen by some as aloof, while others view him as something of a wise-guy jerk. 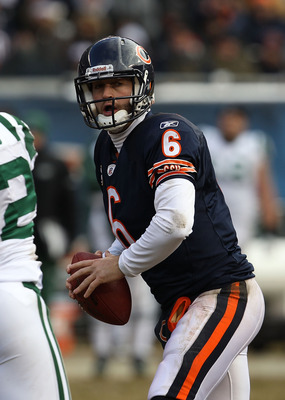 One thing is for certain, Jay Cutler will be key to the Chicago Bears’ destiny this weekend. Love him or hate him, he is the Bears’ quarterback who will try to propel his team into the Super Bowl. Here’s our view of the complicated Cutler. Last week against the Seahawks, Cutler played in his first post-season game and had an outstanding day. In that 35-24 victory he threw two TDs, ran for two TDs, had no interceptions and earned a respectable 111.3 QB rating. But the Seahawks defense failed to effectively pressure Cutler for most of that game. Their coverage seemed to break down, leaving wide receivers wide open. Cutler made the throws he needed to and the Seahawks paid for their miscues. But can Cutler expect the Packers’ defense to play that poorly? He shouldn’t count on it. The Packers’ defense has a blitzing, aggressive style that could expose Cutler’s tendency for making poor decisions that lead to turnovers. Packers’ defensive coordinator, Dom Capers, has had to devise schemes in the past to deal with Cutler. Capers had to defend against the Chicago QB 4 times and was quite successful, with the Packers winning 3 of the matchups. The Packers’ defense held Cutler to a 56% completion rate and only 4 TDs. In those 4 games, Cutler threw 9 interceptions and his QB rating was a pitiful 57.49. Green Bay likes to employ nickel and dime defensive sets – meaning using either 5 or 6 defensive backs. Cutler has struggled against this scheme in the past and Capers will likely use this strategy to rattle Cutler into making some of his infamous bad throws into tight coverage. So which Cutler will show up for Sunday’s pivotal game? Will it be the risk taking Jay Cutler who has never led his team to a winning season since his high school days? Or will it be the effective playmaker we saw last week against Seattle? No one denies his arm strength and his ability to make big plays as a gunslinger-style QB. But given his record INTs last season (26) and his tendency to take risks when pressed, he is an unpredictable factor in this week’s game. An impulsive, risk-taking QB with a brooding personality in an NFC Championship game? Sounds pretty irresistible to me! Today’s NFC Divisional Playoff game between the Chicago Bears and the Seattle Seahawks reminds us of a Quick Pick lottery ticket. It is a thrilling game and is difficult to predict! The improbability of the Seahawks mere presence at this point in the season, combined with the inconsistency of Chicago QB Jay Cutler and the Bears sets up an intriguing scenario. Today’s winner will face the Green Bay Packers next week for the NFC title. The Seahawks and Bears met back in October, with Seattle winning 23-20. Much has changed since that first meeting. After struggling early in the season, the Bears changed their offensive philosophy. Their rushing game improved and they are now a much more balanced offense. Given Jay Cutler’s tendency to throw into tight, dangerous coverage and cause turnovers, a dual threat offense is vital. Chicago RB Matt Forte could be the key to the Bear’s success today. The Seahawks are the first team with a losing record (7-9 regular season) to win a playoff game. But they have been tweaking their roster all season long and seem to have found their ideal starters at the perfect time. Their unlikely journey to this point has given the team a loose, confident aura that may just allow them to silence all their critics. Rather than focusing on their losing season, the Seahawks like to look at the fact that they are 2-0 in 2011. Marshawn Lynch’s amazing 67 yard TD run last week against the defending Super Bowl champion Saints was one of the most phenomenal efforts we have seen all year and worthy of all the highlights and replays on TV. But given the Bear’s defense, it is not likely to happen today. Hasselbeck will have to find WR Mike William if the Seahawks have a chance. Matt Hasselbeck has 11 playoff starts in his career. 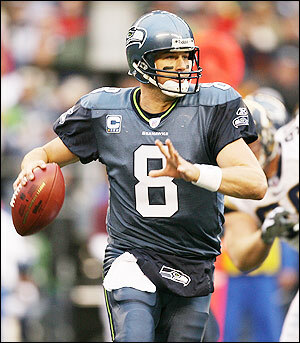 In the last 8 years, Hasselbeck has made the playoffs an impressive 6 times. Meanwhile Jay Cutler is making his first playoff start. Like the Seahawks, he too is looking for respect. A Seattle win would be a more captivating story, given their dubious path to the playoffs. With Hasselbeck’s experience and the “nothing to lose” attitude the Seahawks bring to the game, like a “quick pick” lottery ticket we are choosing them in an upset! Look for a close game, with Cutler turning over the ball to give the Seahawks the slight edge needed to win. The 7-9 Seattle Seahawks pulled off an upset of seismic proportions today, beating the defending Super Bowl champions New Orleans Saints 41-36. Next up: Colts vs. Jets! Today marks the beginning of a weekend of Wild Card matchups. At 4:30 pm ET, the New Orleans Saints visit the Seattle Seahawks. Later, the New York Jets meet the Indianapolis Colts in an AFC Wild Card night game (8 pm ET). Tomorrow, the Baltimore Ravens take on the Kansas City Chiefs at 1. But in our opinion, the most exciting matchup of the weekend takes place tomorrow at 4:30 when the Green Bay Packers travel to Philly to face the Eagles. We will look at Sunday’s matchups later, but for now here’s our take on today’s games. The 5th seeded, 11-5 Saints enter the game as defending Super Bowl champions. The Seahawks have a losing record (7-9), but having won the weak and pitiful NFC West, are the fourth seed and earned home field advantage. It is the first time that an NFL team with a losing record enters the post-season. 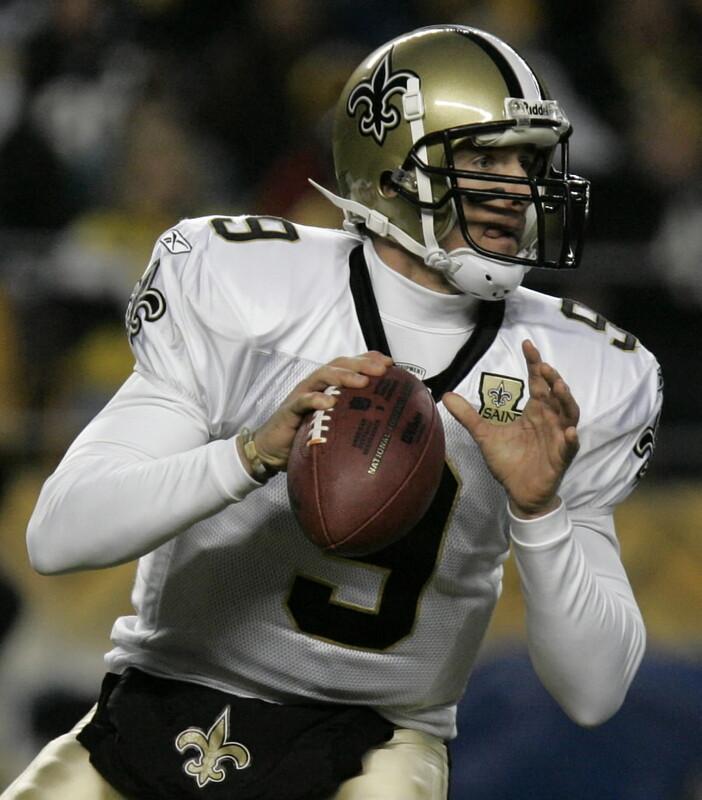 The two teams played each other in Week 11, with the Saints winning 34-19. Much attention has been focused on how the Saints’ two leading rushers will be missing due to injury. It will be up to Reggie Bush and Julius Jones to step up (literally) and get a running game established. While the running game may be diminished, there are plenty of other offensive weapons for Drew Brees to work with. This season, the Super Bowl MVP has thrown for even more yards than last year. Although Brees has more than twice the interceptions he had a year ago, we think wide receiver Marques Colston will make some big plays and help the Saints earn a victory. The Saints have a 0-3 record in playoff games when the game is played on their opponent’s home field, while the Seahawks hold a 4-0 record in the post-season for games played at home. While these are interesting facts, it is unlikely to impact the game. The Saints should easily dominate this game. I’m not the only coordinator or person that Peyton has ever destroyed. I think it’s written that I’m his punching bag. Mine at least has some arms on it. Some of these other guys he plays, don’t have any arms on them. I plan on swinging back. We’ll see how that works out this week. Today’s meeting features two very different teams than last year’s AFC Championship game. The Colts roster is missing some of its most talented names who were key to last year’s victory. TE Dallas Clark and WR Miles Austin, two of Manning’s “go to” guys, are on injured reserve. Meanwhile, the Jets have added new players and appear to have more offensive talent than last year’s team. WR Santonio Holmes was not on the Jets last year and will be a critical factor in a Jets victory. Holmes caught the game winning TD in Super Bowl XLIII and was named Super Bowl MVP. Clearly, he is capable of making a clutch play when it is most needed. If Mark Sanchez does not have any issues with his sore throwing shoulder, look for some big plays between the QB and Holmes. The Jets defense appears to be less strong than last year’s team. Jets starting safety Jim Leonhard is injured, leaving corner backs Darrelle Revis and Antonio Cromartie to handle the Colts’ remaining receiving corps – Reggie Wayne, Pierre Garcon and Jacob Tamme. Revis and Cromartie will pose a threat to Manning’s outside passing game, but throwing down the middle of the field could prove to be a real problem for the Jets defense with Leonhard missing. Jacob Tamme may be Manning’s main target today and may be one of the keys to a Colts’ win. The bad news this season has been the Colts weak run defense, ranked 25th in the NFL. The last four weeks, however, the Colts have shown an ability to contain some big name running backs. It will be interesting to see if they can continue that momentum. Jets RB Shonn Greene will likely get most of the carries today. As Greene pounds away for yardage, the Jets will be able to control the time of possession, thereby keeping Manning off the field. Controlling the clock may be the only true way to stop Manning. This week, however, when asked how Manning can be stopped, Jets Coach Rex Ryan said, “Maybe hit him in the head real hard. That could be one way. We haven’t tried that yet.” One thing is for certain – Rex Ryan sure likes to talk. He has talked about winning the Super Bowl this year, long before the season even started. This week, he talked at length about Manning and the Colts. Today will determine if he and his Jets are able to back up their off the field “tough talk” with their on field play. With a multitude of Indy injuries in the receiving corps and a struggling running game, Manning undoubtedly has carried the fate of the Colts on his shoulders all season. Today, he again holds the key to their destiny. If Jets Coach Rex Ryan believes his brash personal comments targeting Manning will intimidate him, he is foolish. The Jets may actually have more talent than the Colts in this year’s contest. But Peyton Manning is simply a master of the game. Even with his depleted roster, Manning once again found a way to make it into the playoffs. He passed for 4700 yards this season – a career high. In the end, Manning’s unparalleled determination and ability to tear apart opposing defenses will prove to be too much for Ryan and the Jets, no matter how much tough talk they engage in. A Serving of Sunday Showdowns Better than Your Momma’s Best Sunday Dinner! The Giants are in second place in the NFC East, trailing the Eagles. After a five game winning streak, they got shocked by the struggling Cowboys, who had just fired their head coach. The next week, the Eagles served up yet another defeat. The Giants are playing inconsistently, due in large part to the multitude of injuries plaguing the offensive line and receiving corps. It is a must win for the Giants. Their remaining schedule is tough, so they need a victory in order to break their losing streak and get ready for their remaining NFC East division games. The Jacksonville Jaguars are tied with the Colts for first in the AFC South. It is shocking, given how they started the season. Frankly, they have been getting lucky in some games this season. If they lose today, it just may be the start of a long streak of bad luck for the Jags! Should the Jags fall behind Indy, it will be difficult for them to secure a wildcard spot given all the strong teams in the AFC. Two phenomenal QBs meet tonight in what will most likely be a high scoring, blazing contest. San Diego QB Philip Rivers is the top passing QB in the AFC, passing for over 3100 yards this season. He is a favorite for this year’s NFL MVP. For the Chargers, who started 2-5 before going on a three game winning streak, they need a win. They are in 2nd place in the AFC West, behind Kansas City. Their late season comeback has been a great reversal on a season that looked quite gloomy, but if they want to make the playoffs, they simply cannot afford to lose any more games. The Colts are tied with the Jags for first place in the AFC South. It appears that there will not be any wild cards slots from this division, so winning it is the only way a team will make it to the playoff rounds. Peyton Manning has an uncanny ability to win in the home stretch, despite all the injuries the Colts are enduring. 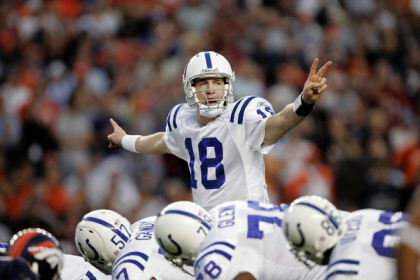 The Colts need Manning to once again work his magic if they are to make the playoffs this season. A win today is crucial. 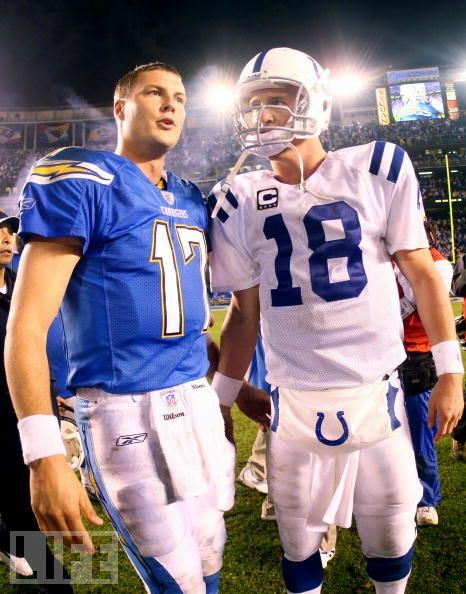 Whatever the final outcome, with Manning and Rivers on the field today, look for a scoring extravaganza! The Kansas City Chiefs hold the first place position in the AFC West, but the Chargers and Raiders are tied for second in a very tight division. The Chiefs need a victory today to keep their division rivals from overtaking the lead, especially San Diego. Kansas City has won all 5 of their home games this season, but as they travel to Seattle, they bring with them only one victory away from home. The Chiefs need a victory on the road to help win the division and leap into the playoffs. The Seahawks lead the NFC West with a 5-5 record. St. Louis is one game behind them and struggling. Winning at this time of the year is important for every team. But in the NFC West, there will likely be no wild card slots because of how poor the teams within the division are playing. The Seahawks need to use their home field advantage to snag a win and keep their top place in the division to earn a playoff spot. There is a full menu of mouth-watering games today. Many of them have playoff implications and are more scrumptious than your momma’s best Sunday dinner. Check out the Bears vs. Eagles, Packers vs. Falcons and the Ravens vs. Buccaneers. With today’s delectable choices, you will be sure to have your football appetite filled!